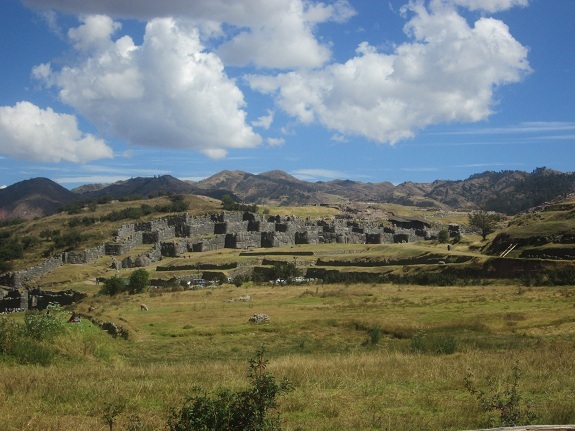 A shrine or a fortress, no one really knows for sure, but whatever its purpose Saqsayhuman is one of Cusco’s best Inca archaeological attractions, and a must visit for any passing tourist. Located on the outskirts of Cusco, high above the town, Saqsayhuman stretches nearly 400 meters (437 yards) in length, and features some of the largest stones of any Inca archaeological site. The name Saqsayhuman roughly translates in Quechua as “Satisfied Eagle,” but the true name and origins of this epic place are fairly unknown. The centre of Saqsayhuman is a large open kancha (or plain). Running the complete length of the kancha is a 3 tiered wall constructed from huge granite stones, many of which measure 9 meters (29.5 feet) tall and weigh up to 200 tonnes (441,000 Lbs.). Behind the wall there is evidence of 3 buildings, two of which are rectangular in shape and the third round. Historians believe that the round building was a cylindrical tower that held water. On the other side of the open kancha there is a huge natural rock formation. A strange waved curvature similar to that of a fun slide at children’s park can be found on the back of the rock. In fact in years gone by local Peruvians actually used the rock as a slide. It is this rock that makes historians believe that Saqsayhuman was indeed a shrine; the natural rock being the point of worship and the large open kancha where ceremonies, rituals and sacrifices took place. At the far eastern side of Saqsayhuman (rarely visited) are the foundations of a large round amphitheatre type structure. Myth says that Saqsayhuman is linked to the Inca Temple of the Sun (Korikancha) by a subterranean tunnel. Saqsayhuman: overlooking the kancha and onto the principal wall. 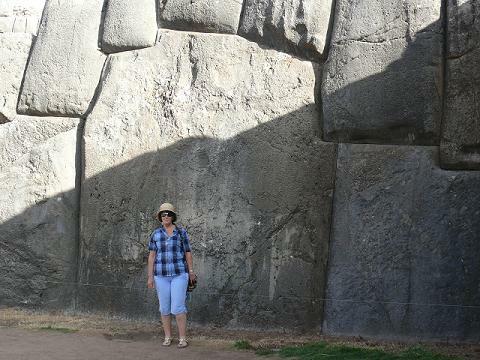 A tour of Saqsayhuman is often included as part of a half day Cusco City tour, but can easily be visited independently. A taxi from Cusco’s Plaza de Armas takes approximately 12-15 minutes and costs between S/.15 – 20 Soles (US$ 5.50 – 7.50) in 2014. 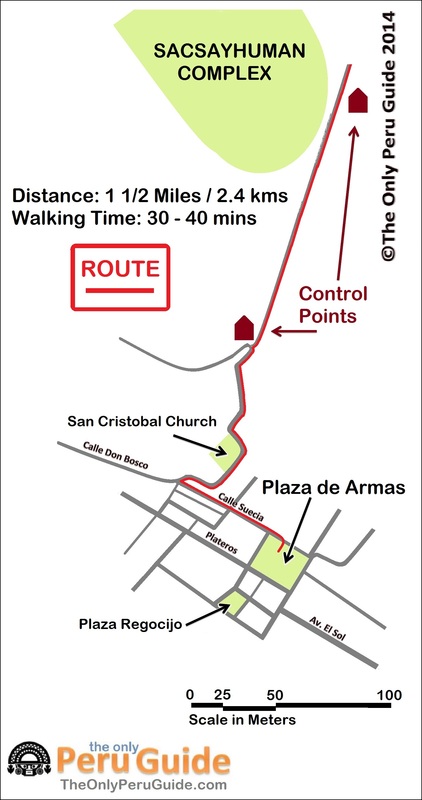 Alternatively you can walk to Saqsayhuman on foot which takes 40 – 60 minutes from the centre of Cusco (see map below). You will need to buy a partial or full Boleta Turistica General (BTG) to gain entrance to Saqsayhuman. The BTG Ticket can be bought in advance or at one of the control posts entering the site. Guides (official and un-official) can be found waiting around the control posts entering Saqsayhuman. Prices vary, but expect to pay between S/. 50 – 100 (US$ 18 – 36) for a 2 hours guided tour.